Timber Cladding provides many positive benefits, from being durable to being contemporary and versatile. Featuring our Siberian Larch Cladding, Grand Designs showed their viewers just how adaptable timber cladding can be. Looking to create a unique hideaway in the Essex woodlands, we supplied our timber cladding to a couple wanting to achieve a unique, hidden space that was personalised for them. 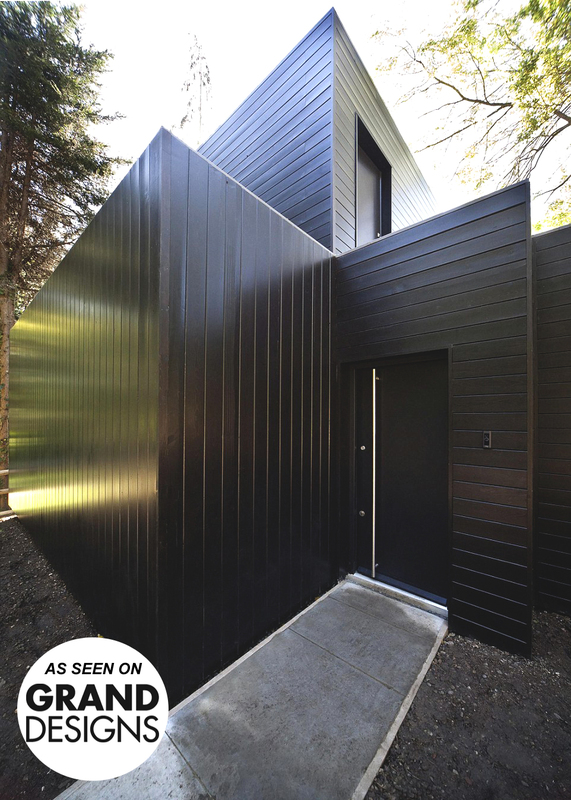 By requesting our Siberian Larch cladding in a satin black finish, our cladding showed how architectural conventions can be defied but still achieve aesthetically pleasing outcomes. 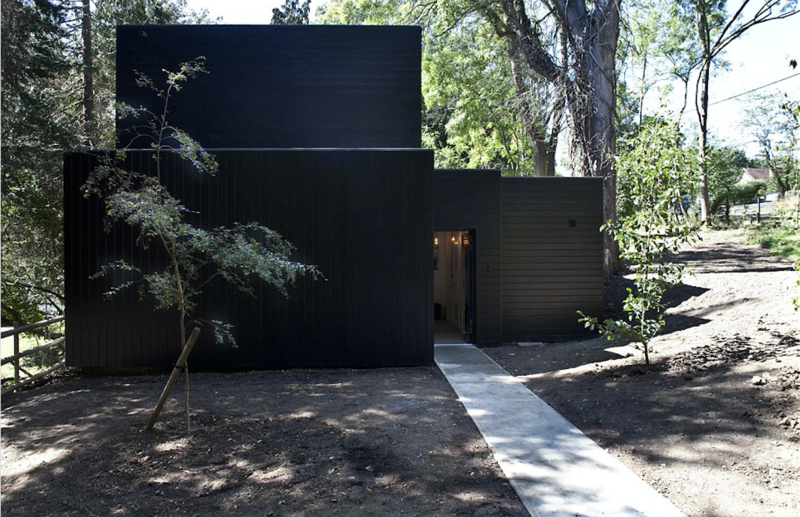 As the black cladding was used in such a dark environment, Kevin McCloud became sceptical of the design choices. So how did we achieve a beautiful and successful outcome with such bold cladding? During the show, Kevin McCloud stated that larch is “plentiful, affordable and durable even in its natural untreated state” which is just one of many reasons people all over the world choose it for their builds. Mainly growing in the Russian forests, the severe seasons allow Siberian larch to grow very slowly, giving the material its longevity and durability. Making sure we always produce the highest quality cladding for the best results, our materials are certified to either FSC or PEFC standards. Our Siberian Larch comes from sustainable forests, imported in rough sawn planks and machined through one of the moulding machines in our mill. This process moulds the plank into the profile required and planes it at the same time. In this case, the finished board was 20mm deep and 144mm wide with a secret nail profile, hiding any evidence of fixing nails when viewing the finished product. By using this method, we managed to enhance the polished and smooth design that was achieved. Untreated boards can be used for cladding, turning into a desirable silver grey after time. However, in this Grand Designs episode the couple took an unconventional turn to customise the build to suit their preferences, aiming to attain a striking and sleek yet private home. The desired visual outcome of a black satin finish was completed at the coating shop where we used the Teknos 3 coat system, which includes a base coat and 2 top coats using 30% satin finish in black translucent. Each coat is put on through a vacuum coater which applies accurately and consistently, the boards are then left to dry in-between coats to ensure the high quality finish. Once the coating was completed and the boards were dried naturally and given a final quality check, they are then carefully packed and loaded for transport to site on Bennetts or a third party's vehicles. Ready to be fixed into place on site, the prepared cladding resulted in being a pleasant surprise to many viewers once fitted. 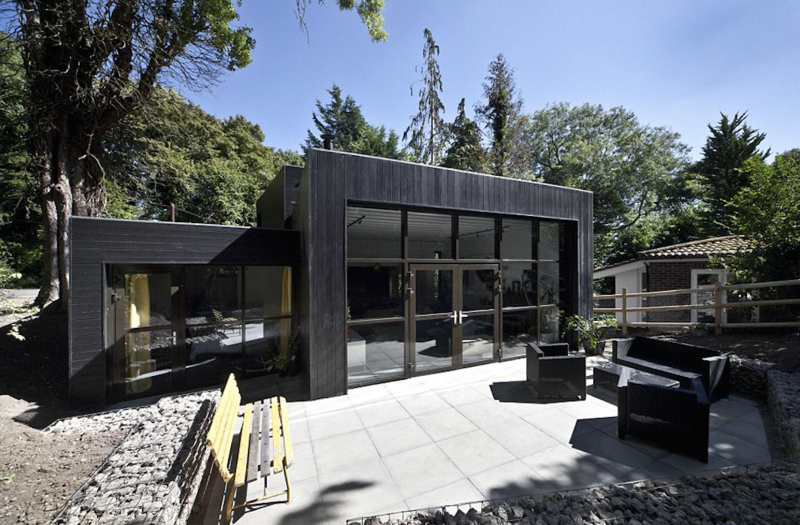 By wanting to achieve a private hideaway that looked natural and blended in, the black cladding we provided encapsulated the couples design ideas. Using our Siberian larch cladding in satin black, the darkness within the woodlands captured the light vs dark concept beautifully. Sleek and hidden externally but light and contemporary internally, this build showed how cladding can be used and customised for any homeowner to fulfil their visions. Are you thinking about using timber cladding your project? We can offer bespoke solutions tailored to you. Just give us a call on 01472 350151 or email sales@bennettstimber.co.uk and we'll be more than happy to help. You can also view our range online.